Welcome to English Country Dancing! We remember how confusing it all seemed at first, so we've put together a list of beginner basics to help introduce you to this wonderful activity. 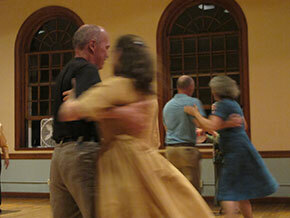 All English Country Dancing is done with a partner, and it is perfectly acceptable for women to ask men to dance, or for two people of the same gender to dance together. It is customary to change partners for each new dance. 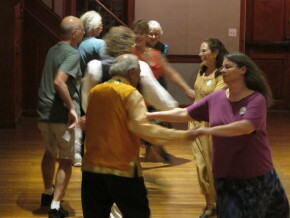 During the dance, you'll dance with your partner, and also with all the other dancers as you move through the patterns of the dance. Each dance has its own music and patterns, but almost always you will progress along the line of dance either toward the music or away from it, depending on your particular position. When you reach either the top of the line (the end of the hall where the musicians are located) or the bottom (that's right .. the opposite end), you will wait out one round (sometimes two) of the dance and then begin to progress in the opposite direction from the one you had before. The caller guides the dancers through the required movements by announcing each new move just a fraction of a beat before it must be performed. Experienced dancers will also give you cues by their body language, so it is important to keep looking at your fellow dancers, especially your partner. 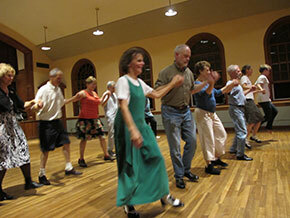 Eye contact is characteristic of English Country Dance. 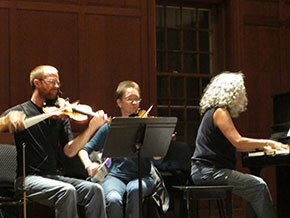 Cues can also come from other dancers' hands and arms. When we turn another dancer with one or both hands we use enough mutual resistance to achieve a balanced tension, so that the timing and direction of the turn is satisfying. 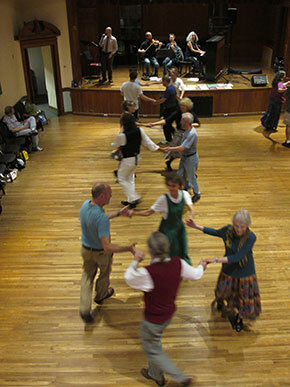 The beautiful and varied music is one of the greatest pleasures of English Country Dance. 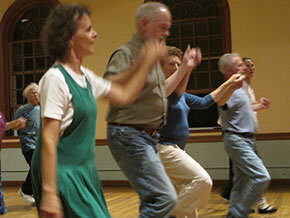 Some fast, some slow, some romantic, others rollicking, the tunes help the dancers keep pace with the music. We match our steps to the beat of the music. 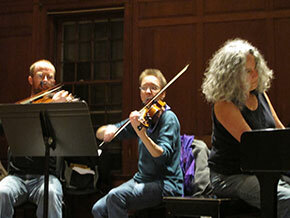 If we fall behind, we don't try to catch up, but begin the next movement in time with the music and the other dancers. Remember, everyone goofs some of the time, and all of us were beginners once, so relax. Just smile and go on with the dance and soon you'll find you've got it. Try sitting out a dance and watch for a while. You'll see how the patterns repeat, and how the timing works. Finally, come again. 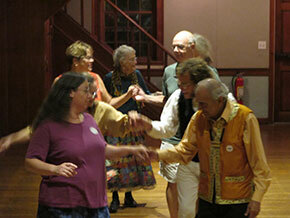 Each time you return you'll become more familiar with the dances -- and we will look forward to seeing you!